Model the world as entities and links, honoring the way teams are trained to think. This simplifies complex networks, helps detect non-obvious patterns, and promotes lateral thought. 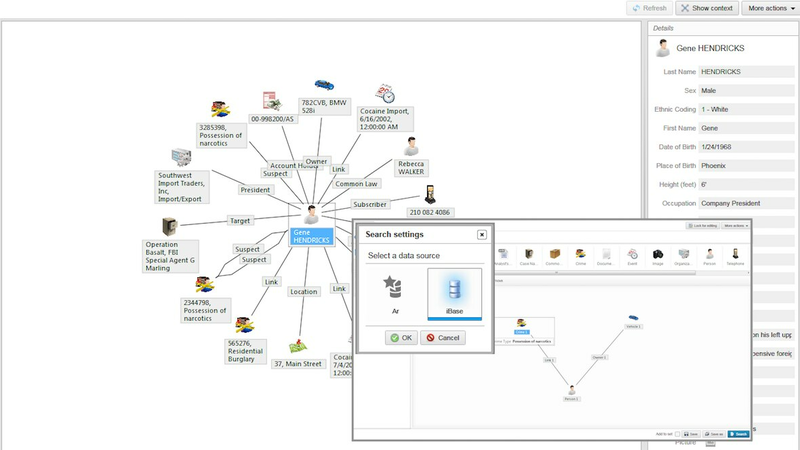 Increase the potential of information discovery via multiple search techniques, including text search and visual query. 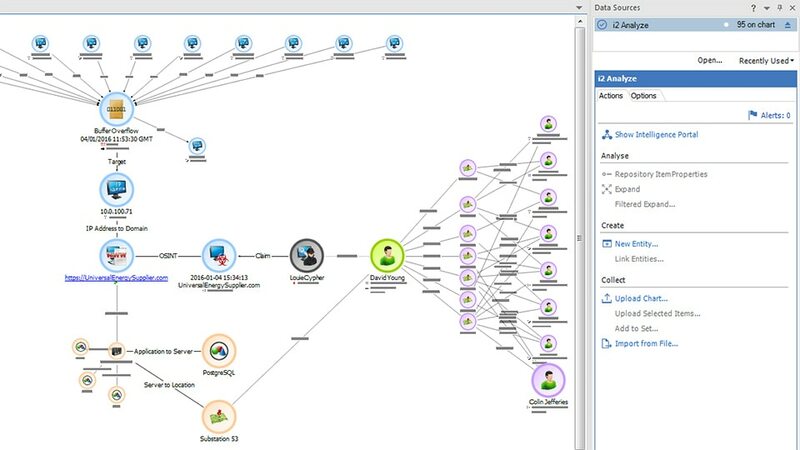 IBM i2 Analyze enables analysts and wider operational teams to work collaboratively across boundaries, whether organizational or geographical, sharing information and decisions in real time. Access a wide range of disparate data sources for comprehensive, efficient and speedy production of actionable intelligence. 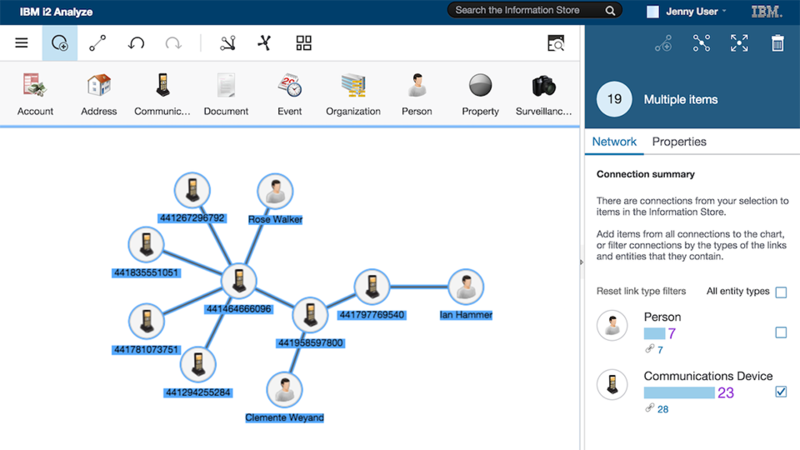 Leave data at source or fuse data from multiple sources into a centralized, aggregated view. Integrate with your existing infrastructure to complement current processes and procedures. Meet specific deployment requirements by creating custom extensions and data acquisition connectors using the Developer Essentials Toolkit. All access is controlled through a highly configurable, fine-grained and pervasive security model. Using built-in tools or links to your organization’s existing directory services, the authentication and user management model provides logical segmentation of information based on clearance, operation, case or other business requirements. Overwhelming data set and data silos make it challenging for you to uncover hidden connections and insights in data. A common collaborative analysis environment and visual analysis capabilities help your team efficiently and effectively create and share intelligence. Organizations often have several departments and data silos, which can make it hard for you to identify threats and problems that could be brewing across those silos. i2 Analyze equips you with enterprise analysis capabilities and a secure and shared repository that helps break down those silos, so you can better identify threats and problematic trends otherwise hidden in internal and external data sets. Check out the operating system requirements for i2 Analyze before you buy. Check out the hardware requirements for i2 Analyze before you buy. There are no technical specifications for i2 Analyze.